She attended Palmer College of Chiropractic to earn a Doctor of Chiropractic degree, graduating in 2014. It was there that she received her first adjustment using the Gonstead Technique. The results she got from this precise analysis were remarkable. 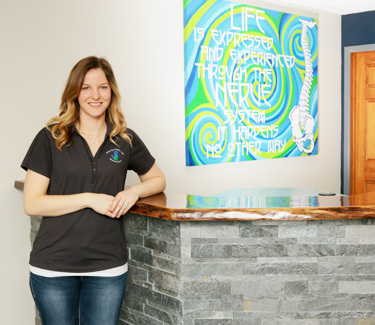 Today, it’s her primary technique at Family First Chiropractic Wellness Center. While in school, she was a student intern and teacher for the prestigious Troxell Intern Program and is currently an instructor with the Gonstead Methodology Institute. She also participated in a clinic abroad trip that took her to Vietnam to share all that chiropractic could do. Dr. Jenny loves seeing kids, moms and dads, often witnessing the extraordinary miracles her patients experience from chiropractic care. One was a 3-year-old girl who wouldn’t talk due to a debilitating stutter. After chiropractic care, she was able to chatter away! Other children could stop taking their constipation medication and found relief from other digestive-related troubles. Dr. Jenny and her husband are big foodies who enjoy going out and trying area restaurants and different cuisines. They also love to travel and visit their friends and family. Dr. Jenny is a Green Bay Packers and Wisconsin Badgers fan and likes to watch their games and cheer on her teams. If you’re ready to find out more about what we can do for you, contact us today to arrange an appointment!